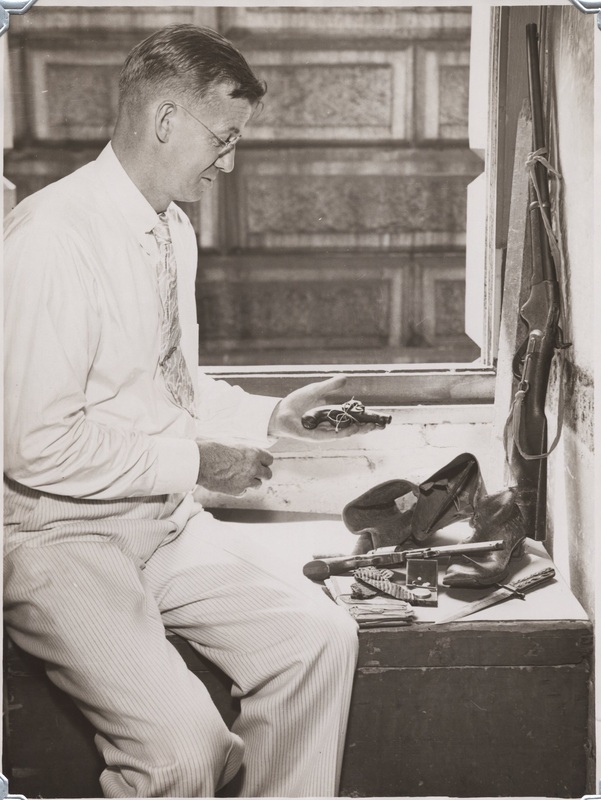 This image of Edwin Pitts also provides a nice look at some of the other assassination related artifacts. The above portion of the image shows the Spencer carbine retrieved by Booth and Herold at the Surratt Tavern and the wooden bar used to block the door into the box at Ford’s Theatre. Among the items shown above are Booth’s boot and compass. There is also the tie attributed to George Atzerodt and a pack of papers that looks like it could be Booth’s diary. I’m not sure which pistol that is, but it could be one of Booth’s. The knife shown is the etched “Liberty” knife that, while currently on display at Ford’s Theatre as Booth’s knife, was not recovered from his body at Garrett’s farm. 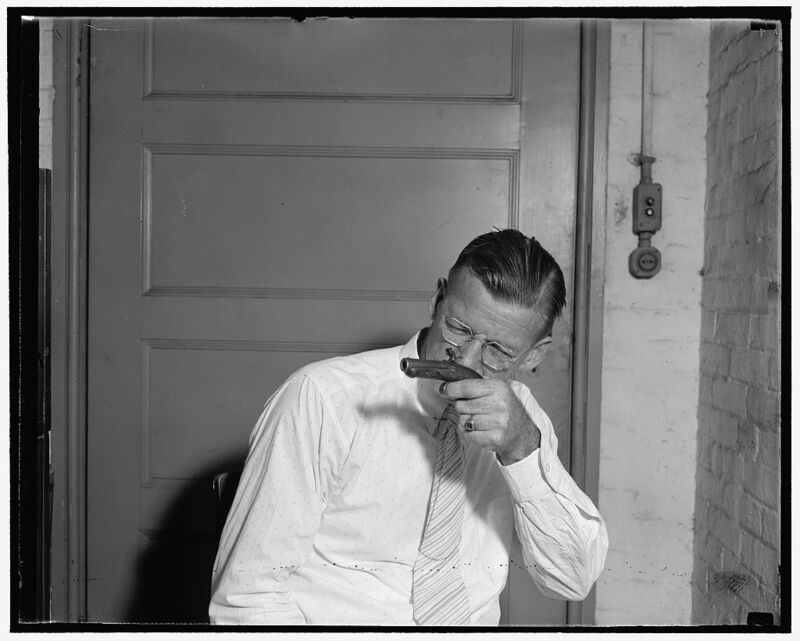 After finding two different images of Edwin Pitts holding Booth’s gun, I’m wondering how often Mr. Pitts took the relic out of storage to pose with it for curious photographers. Dave, the revolver is the 1851 Colt “Navy” revolver displayed at Ford’s Theatre as Booth’s. Note the string tied on the Deringer. That is to keep from losing the hammer since the head of the hammer screw was missing. A new screw, actually an ordinary wood screw rather than a genuine Deringer-produced one, was used to repair it sometime in the 1960s or 70s. There’s no way to know if the screw was broken when Booth possessed or at some later time after its recovery. If it was like that when Booth had it, he’s lucky it didn’t fall apart when he pulled it out in the Presidential box. I believe Pitts is sitting on the wooden box that the evidence was stored in at the War Department. Thanks so much for commenting on the revolver. I was really hoping you would. I also 100% agree with you that the large chest Mr. Pitts is sitting on is probably the high tech storage system that the relics were placed in at the War Department. So perhaps those papers could also be some of the labels and paperwork that went along with the artifacts. A great photo. Where the heck did you find it?! I wonder if the gun broke when Booth dropped it after he fired it. We;ll never know. It could also have accidentally been dropped on a hard wooden floor some years later. Are you able to show the AP photo of Frank Hebblethwwaite holding it out to the camera, on a pc. of linen cloth? By the way, it looks like you may be right about it being Booth’s diary. But there are some things on top of it. Do you think it’s just string to keep it together? How long ago did Booth’s stick pin and the religious ( ? ) medal disappear? It’s funny how in this picture the gun is handled with gloves and has guards while 50 years earlier Edwin Pitts essentially played with it like a toy. Looks like he has Powell’s Whitney revolver there as well…. I don’t see Powel’s revolver; Booth’s Deringer,Booth’s Colt, and the Spencer carbine picked up at Surratt’s Tavern. I thought the same thing about the earlier photos and the carelessness – no white gloves like Frank Hebblethwaite is wearing in the later photo. Good to see Frank’s picture — and yes, I’ m surprised at how times have changed….white gloves and all! oh wait! Is that booth’s boot? I think I see a pocket in it! 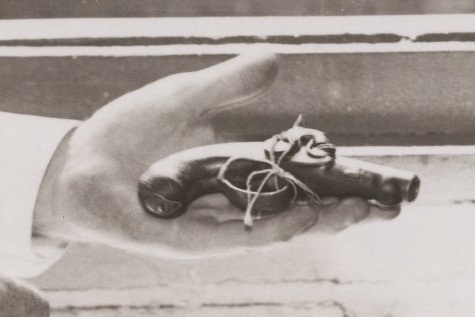 Derringers were usually sold in matching pairs so it is thought that at one time Booth’s pistol had a partner, however there have been MANY different stories regarding finding Booth’s “other” derringer. I don’t believe any of the so called Booth derringers match the same size as Booth’s real one.